If the question is, "How will I spend my last few hours on this Earth?" 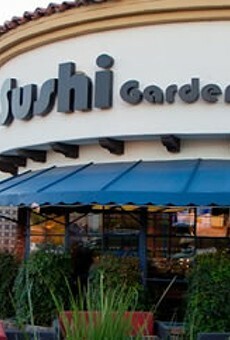 one possible answer is Sushi Garden. Where else can you drink a "zombie" while eating raw flesh? The tempura rolls are so ethereal, they seem to evaporate from your plate. The bar is bustling with sleek television screens to watch the latest reports on the apocalypse. Happy hour is Sunday through Thursday, from 4 to 7 p.m., and after 10 p.m. every night of the week. Fortify yourself with $4 sake bombs to take your mind off the actual explosions you hear out in the streets. Order an extra California roll while you watch the real California fall into the ocean.